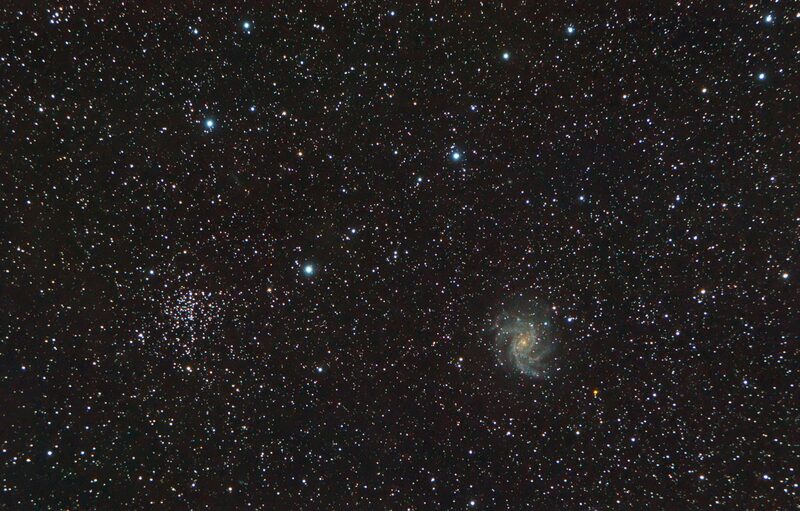 NGC6946 is known as “The Fireworks Galaxy”, probably because of the distinct array of colours found within, from the deep yellows of the dying old stars at its centre to the hot blue clusters of younger stars in its outer arms. It presented almost at zenith just after the onset of astronomical full darkness last week, so I set up in my reasonably dark lay-by on the A591 and spent the whole evening – until about midnight – imaging this one target. Immediately next to the galaxy, from our point of view, is NGC6939, an open star cluster that lies within our own galaxy. Star cluster NGC6939 with galaxy NGC 6946. The star cluster is about 5,000 light years away, and the Fireworks galaxy is about 22 million light years away. That’s still difficult to grasp, looking at them together in the photo. It’s like snapping Kendal Castle from my bedroom window and glimpsing the Taj Mahal in the background. Crazy perspective. Visually, the galaxy is very small, only about 10 arc minutes (one third of the Moon) in diameter. At magnitude 9.6, it is well below naked eye visibility. I guess I would have liked better quality from the image, but the local conditions were not helpful that night – light, humidity and an unfortunate number of cars driving by on full headlights. There’s another obstruction, which is that this galaxy is in line with the plane of our galaxy, so the photo is taken through the permanent clouds of interstellar dust at the edge of the Milky Way. Torn between astrophotography and sleep for this one! Our walking holiday on the Amalfi coast had finished on Saturday with a beautifully long slow lunch among friends on the terrace at Leonardo’s in San Lazzaro, and our late flight out of Naples finally put us down at Gatwick at about 11.30pm. Overnight hotel at the airport, train journey to have lunch with my mother-in-law (where we had left the car) then a five-hour drive home to Cumbria. We arrived home in the early evening on Sunday, ready to drop. The Moon was set to move into the Earth’s full shadow at about 2.15 Monday morning, so I set the alarm for 1.30, as you do. The forecast was good, it had been improving steadily over the last couple of days, and I guessed that if I woke up and looked out just before the start of the action I would be able to decide whether it was worth setting up a session. 2.06am. The shadow is just visible. Nikon D90 through Nikkor Nikon 300mm f/4 AF. 1/1250 sec f/8, ISO 800. I decided to take one shot every 30 seconds, with the intention of stitching them together as a time-lapse video. 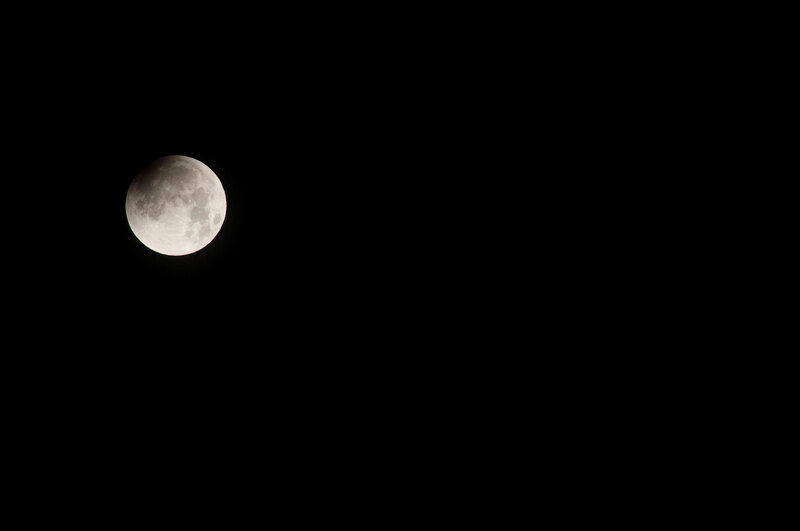 Of course the Moon drifted fairly quickly across the frame so the tripod had to be adjusted every few shots. 2.45am: 40 minutes into shadow. 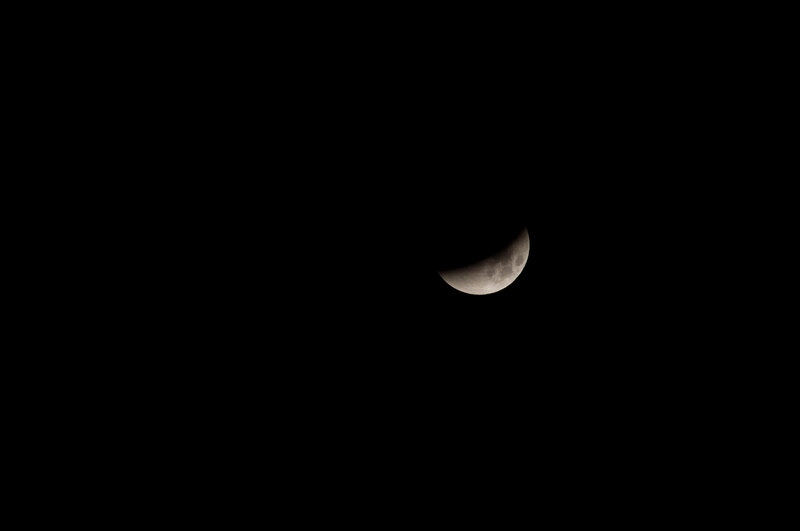 By the time the Moon was about to disappear behind the house, it was in full eclipse. 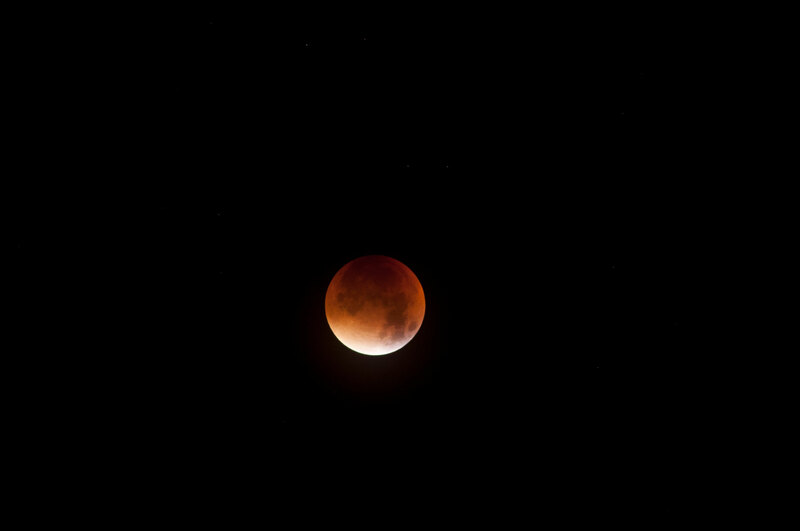 3.12am: exposure increased to see the illumination in full eclipse. 1 sec @f/5.6, ISO 1000. Noticeably very red to the naked eye – and the camera – it was somewhat of a disappointment in binoculars as the brightness dropped so significantly. This could be because the Moon was almost at perigee (the so-called “supermoon”), closer to the Earth than normal and therefore deeper into the cone of the Earth’s shadow. The air went a little murky too, so the final shots lost some definition. Each frame had to be cropped and realigned to make the video run smoothly. Stitched together and reduced from 4288 x 2848 to 1000 x 1000 pixels, these make a reasonable time-lapse.